Digital Eyes is 1st the name of an art gallery in SL. With time and spare prims I've made a store hidden under the gallery to propose fashion accessories that I use IRL like fans, feathers, hair. I have finally decided to be able to answer yes to the frequently asked question: "do you make eyes at Digital Eyes?" 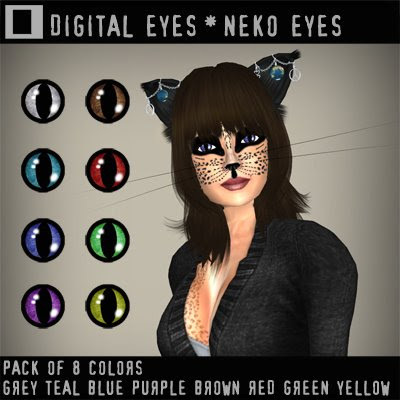 The 1st serie is a pack of 8 colors for the nekos.